Actor, humorist, author and woodworker Nick Offerman will give the commencement address at the University of Illinois on May 13. Offerman is a 1993 graduate of the U. of I. in theatre. 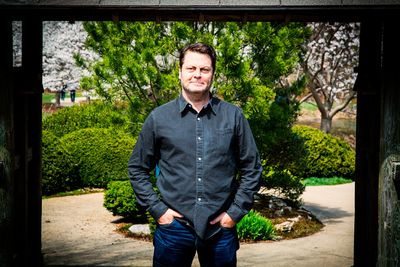 CHAMPAIGN, Ill. — Illinois alumnus and actor, humorist, author and woodworker Nick Offerman, best known for his role as Ron Swanson on the NBC hit comedy series "Parks and Recreation," will be the U. of I.’s commencement speaker Saturday, May 13. The ceremony is 9:30 a.m. in Memorial Stadium. Offerman is a 1993 graduate of the U. of I. in theatre. A native of Minooka, Illinois, Offerman learned basic carpentry from his father. He used these skills in building sets in the scene shop at the U. of I. While a theatre student, Offerman enrolled in a Kabuki theater class taught by Shozo Sato, the founder of the U. of I.’s Japan House and a professor emeritus of art and design. He flourished in the class and became close to Sato, traveling to Japan with Sato's Kabuki troupe. After graduating, Offerman moved to Chicago, where he and a group of U. of I. students founded the Defiant Theatre, an experimental acting company. Offerman continued to build scenery and props for large unionized theaters to supplement his meager acting income. His work also includes TV roles on “The Simpsons,” “Fargo,” “Bob’s Burgers” and “Drunk History,” and in films, including “We’re The Millers,” “Sin City,” “21 Jump Street,” “22 Jump Street,” “Smashed,” “The Lego Movie,” “The Founder,” “Me and Earl and The Dying Girl,” “Kings of Summer,” “A Walk in the Woods” and “The Men Who Stare at Goats.” His most recent project is a six-episode reality series he’ll host with Amy Poehler called “The Handmade Project,” which will feature a competition among artisans and makers. Last October, Offerman released his third book, “Good Clean Fun: Misadventures in Sawdust at Offerman Woodshop,” a New York Times bestseller. His series of humorous publications began with “Paddle Your Own Canoe: One Man's Fundamentals for Delicious Living” in 2013 and “Gumption: Relighting the Torch of Freedom with America's Gutsiest Troublemakers” in 2015. Offerman continues to operate his woodshop in Los Angeles, where he and a team of woodworkers build handcrafted canoes, fine furniture and other items. He built a gazebo, made from salvaged California old-growth redwood, on the grounds of Japan House to honor his teacher Sato. Offerman visits campus for special events and fundraisers to benefit his alma mater. He was on campus April 1 for a “Whiskey, Wood & Barbecue” fundraiser for Japan House that included a raffle of items from Offerman Woodshop. He brought his “American Ham Tour” to Krannert Center for the Performing Arts in 2013 as a benefit for Japan House. Information about commencement, including convocation and reception details, ticket distribution and parking, can be found at http://commencement.illinois.edu/ or through the commencement app at go.illinois.edu/commencementapp.